Blackhole is a massive reverberator that has evolved over the years by pulling in mass quantities of time and energy (of the development persuasion, of course). In its earliest incarnation – first in the DSP4000 and later in the H8000 flagship processors - it was regarded, by some, as a secret weapon. Recently it was tuned, expanded and enhanced and then unleashed in the Eventide Space stompbox. Now, it's available as a Native plug-in. 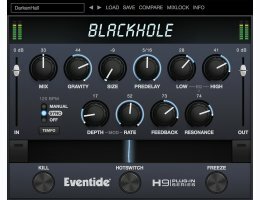 April 2018: Eventide Blackhole is now NKS-Ready for Native Instruments' Komplete Kontrol and Maschine. An iLok account is required to authorize Eventide products. With the iLok License Manager, you can deposit your license either on a 'computer' or on the 'iLok Dongle. iLok keys can be purchased from www.ilok.com or at your local dealer.